Clutter that builds up around our home can signify a few different things going on in our life. Many times it can be emotional situations we are dealing with, and our environment is reflecting what is going on in our life or how we are feeling. I frequently hear, “how do I let go of clutter?” Many people know the “process” of decluttering. However, the missing piece for some is the emotional surrender and the challenge of letting something go. 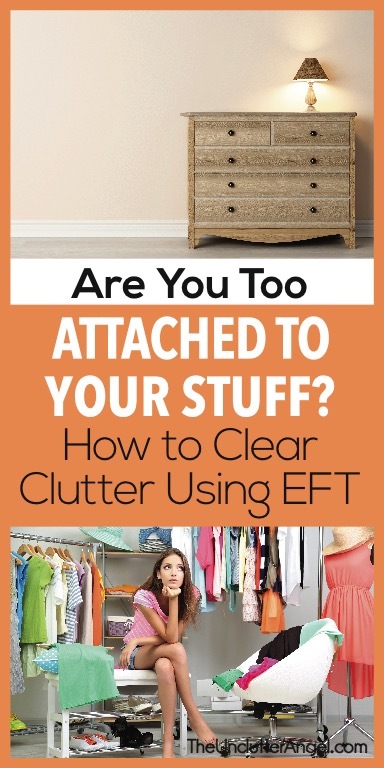 In this post, I am going to focus on just a few of the above, and how EFT can help with letting go of clutter. RELATED POST: WHY IS IT SO HARD TO THROW THINGS AWAY? EFT, the emotional freedom technique, also known as tapping, is like psychological acupressure. You may have tried acupuncture or acupressure before, where eastern medicine uses needles or pressure on specific points on the body to help with physical aliments. EFT or tapping, can help with physical issues, but it also can offer amazing relief for those who suffer with emotional issues too. Eastern medicine believes that negative energies, emotions, and stress can get stuck in areas of our bodies or “meridians”. By using tapping, these emotions and energies can get unstuck and released. I started studying this method when I was looking at the emotional side of decluttering and helping my organizing clients. In my book, “Conquer Your Clutter with Tapping“, I share how experts describe how we all have some kind of trauma. Trauma can be memories or emotions that have got “stuck” in our bodies. This doesn’t need to be horrible or huge incidents like war or crime. It can be a change you had to make, people you aren’t in a relationship with anymore, or unexpected situations. You may not have thought about piles of clutter as a reflection of the past like memories, trauma, or stress, but it can. These traumas or memories can leave an impression on us like a stamp on our mind, like something that is left behind well after the event. Have you ever been in a situation and a memory quickly pops up in your mind? Has it ever been a negative one that you wish you could leave behind and forget about? 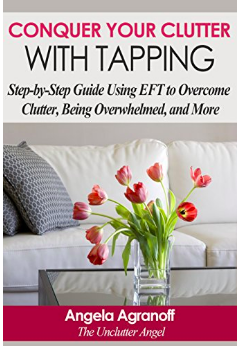 EFT is an awesome tool that will not only help to understand your emotions around your clutter, but also give you the ability to move forward to decluttering and feeling free! 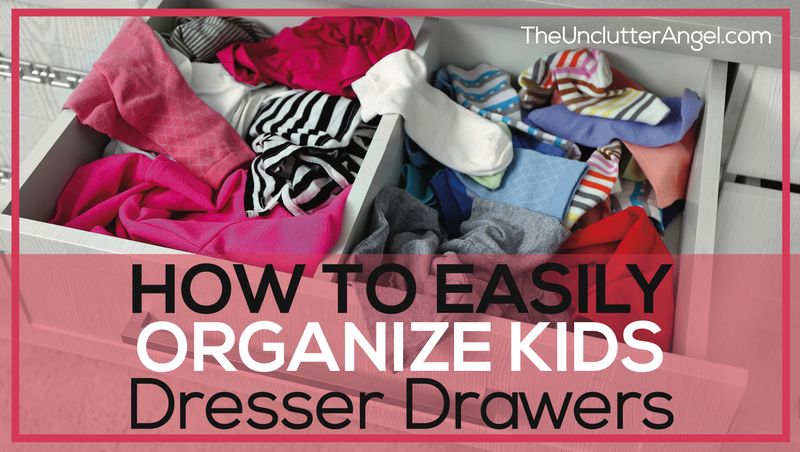 This may seem like a strange tool for a professional organizer to keep in their back pocket to help clients, but I know from personal experience, that this works! Having the ability to shift my thinking when I personally use EFT to take myself out of a state of frustration or overwhelm is amazing! 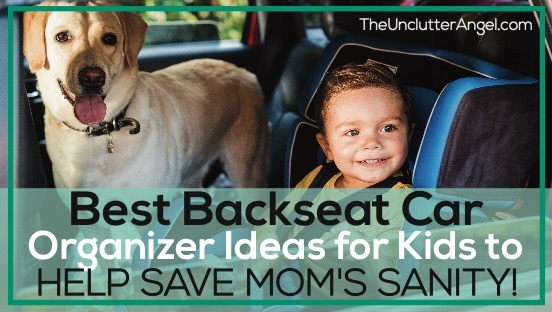 I have used this with my kids and past clients as well. What is wonderful about EFT, is it is very simple and easy! IMPORTANT: If you are working with a counselor or doctor that you don’t use this in place of your care. Talk to your doctor to see if this can be part of your care plan. I am not a doctor, I am an EFT Practitioner. I do not claim that EFT can medically heal or cure anything. Everyone’s experience is different, and has helped many to relieve stress, anxiety, and pain. I personally have found relief in situations where I felt stressed and overwhelmed. Being able to break patterns in my head that were repeating over and over, and paralyzing my thoughts process, is a valuable tool! HOW DO I DO TAPPING? I will share with you how to tap on a few points on your body. This tapping doesn’t need to be hard to get results. In fact, it should be gentle and not hurt at all. It’s helpful to review the different tapping points and how you can rate your emotions about your decluttering situation, as well as any situation you feel you need relief from. While tapping on karate chop point, repeat the set-up statement three times. You can change it to sound more like you and needs. By using this set-up statement, we are acknowledging what the issue is, and we still love and accept ourselves, no matter what. Instead of beating ourself up, we are loving ourselves and trying to understand our thought process. The sequence include the remaining tapping points in the tapping round. You can tap 6 to 8 times on each tapping point, following the karate chop point. Don’t worry about tapping perfectly on each spot, it can still work if you are off. I have seen people do some pretty interesting things while tapping, and it still works! Like with business or health goals, it’s can be helpful to assess your progress. Whether you like to keep a journal or notes on your phone, it may be encouraging to keep track of your progress. Before you start a tapping round, you will want to assess your emotions. Take a deep breath while thinking about the situation you want to tap about. Really feel the frustration, anxiety or whatever you are feeling. Check yourself on the emotional scale. Asses yourself again after each tapping round so you can measure your progress and know what you may want to work on more or areas you feel you feel better about. Use that SUDS scale rating yourself from 1-10. Journal about your journey overtime. 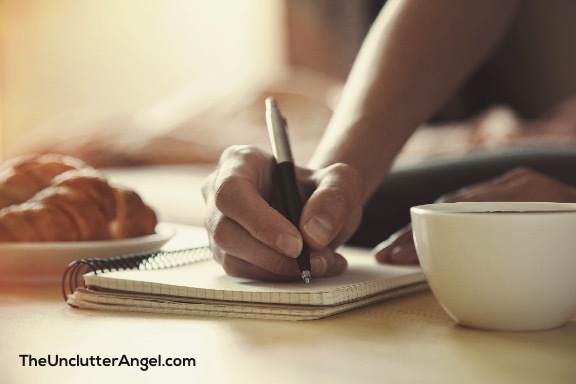 If you have a number of issues that you want to work through, they may be beyond the challenges of getting organized, journaling about your progress over days, weeks, maybe even months will help you to see your progress. This is especially helpful for the days you get hard on yourself. Look back at your notes and remind yourself where you have come from, the amazing shifts your mind has made, and how your life has changed. 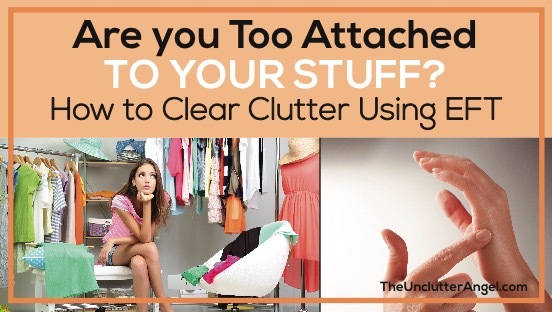 WHY IS IT HARD TO LET GO OF STUFF AND CLEAR THE CLUTTER? Have you asked yourself this before? What seems like a simple project, decluttering and getting rid of the items you no longer need, can be difficult for some. I have always believed that decluttering and getting organized is so much more than just getting our environment clean and tidy. Some things are very easy to purge and get organized. Other items have memories and emotions involved, and this can make it a little more difficult for some to let go of things. You may even know in your head that you will never use it again, you haven’t used it in years, but it pulls at your heart strings. It belonged to a loved one, it has sweet memories, you feel guilt about letting go, and so much more. We tell ourselves many stories about our stuff, what we need to do with them, why we should hold onto them, how our stuff defines us, and on and on. We aren’t our stuff. Our stuff doesn’t define who we are. Our stuff can hold us back from living the life we were meant to live. It may be hard for you to let go of clutter because you are placing a value on your items. Not just monetarily, but emotionally. When our heart-strings are being pulled, or past memories come into the picture, it can effect the decision making process. Now that you understand what EFT is and how to do it, we can start implement what we have learned. I am including two scripts. 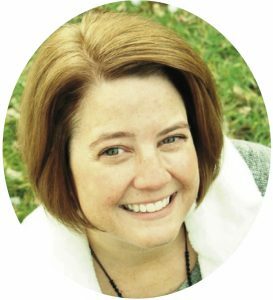 One script will walk us through the negative feelings that we have about letting go of our stuff. The next script will take us from the negative feelings into positive ones. I find by acknowledging the struggles we are experiencing before trying to adjust what we are feeling and saying to ourselves, makes it more real and believable. If I go straight to how I wish I was thinking, it may take longer to work through your stress, overwhelm or anxiety. There are times that I will tap for a quick release if I am in a frustrating or upsetting situation. With tapping there aren’t absolute rules, which gives us the ability make it suit our personal needs! Get a picture in your mind of the areas you want to declutter, or the pile of items you are having a hard time letting go of. Really feel it as you begin tapping. – Even though I am having a difficult time letting my things go, I deeply and completely love and accept myself. – Even though I am struggling to get rid of this stuff, I deeply and completely love and accept myself. – Even though I am in conflict with my stuff, I love and accept who I am anyways. Under nose: Who could I give this to that could use it? Chin: If I give it away to someone, am I passing on the burden? Top of head: I can decide that I want to declutter and feel good about my space, once and for all! Rate yourself on the emotional scale again to see if things have changed for you. What was the first thoughts you started with with you were tapping on your karate chop point? Rate it again 1-10. 1 being “I am ready to start my decluttering projects”, and 10 being “this is still emotionally hard to think about doing”. – Even though I am having a hard time letting go of my stuff, I deeply and completely love and accept myself. – Even though I am sad that I have to deal with this, I deeply and completely love and accept myself. – Even though I am struggling with letting go of this stuff, I love and accept who I am right now. Under Nose: Then I can be free from my stuff and the nagging feeling that I still have it! Top of head: I can open up my life to new possibilities and create a space that I love! If you are at 5 or higher, consider doing another round of tapping. You can change the words too. Even if you don’t see results right away, keep tapping. Like an onion, you keep peeling away at your thoughts, frustrations, and fears to get to the center of it all. Be consistent, and you will make progress on what is holding you back from letting go of your clutter. 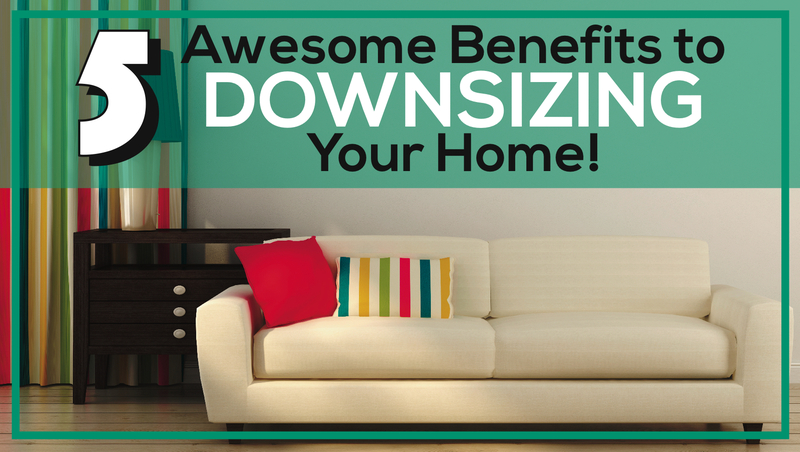 Before you know it, you will moving forward and creating a space you dream about! 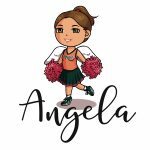 This is really great Angela. We sure do need more methods to help people. One of my clients uses tapping to help people with health, wealth, and relationships. It’s interesting to see it has so many applications!